As remodeling projects ramp up for homeowners across the U.S., hardware choices will continue to play an integral part in creating stylish kitchens and baths. According to Harvard University’s Joint Center for Housing Studies, home remodeling is projected to grow at about 7 percent this year, indicating that the industry is alive and well. Meanwhile, the recent True Cost Report from HomeAdvisor found that 82 percent of millennials, 70 percent of Gen Xers, 60 percent of Baby Boomers and 39 percent of the silent generation plan to spend more on renovations in 2018 than they did in 2017. 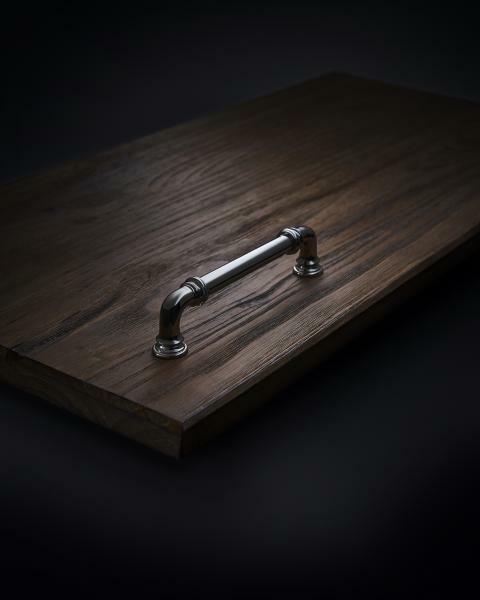 In designing a kitchen or bath, small details such as cabinet hardware can make a big difference in updating a room’s look or achieving a certain style. Often overlooked, they are a design element that may only be noticed if they are done wrong. They must also coordinate with everything from faucets to appliances, which are both increasingly offered in a wider variety of styles and finishes. And interior doors are no less important—especially in today’s popular open floor plans, coordinating interior door hardware with the rest of a home’s fixtures and finishes is essential to creating a cohesive look. From kitchen and bath cabinetry to interior doors, every home design includes several interior hardware decisions that should not be considered lightly. Here are 7 hardware trends to help design and remodeling professionals stay on target with their design goals. 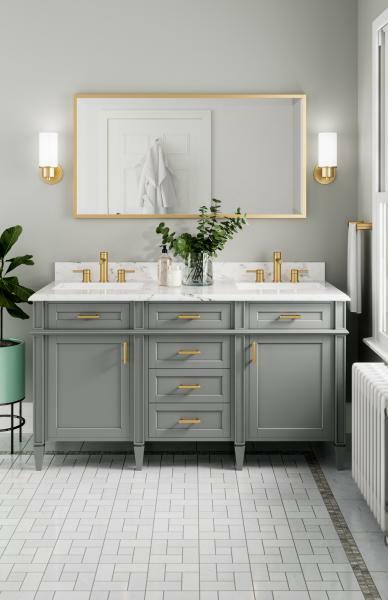 This is no longer the bright yellow brass of years past: These days, brass and gold tone finishes are back in soft and warm tones. These finishes pair well with white and dark woods surfaces and with other trending finishes like matte black. Tones can range from bold to subdued, giving homeowners and designers every opportunity to find the perfect shade. The brass revival is a welcome change in a world that has long been dominated by chrome and nickel. It is a way to make a design statement without being too flashy. Top Knobs recently added two new finish options, Honey Bronze and Ash Gray, to a number of its collections, including Devon, shown. Honey Bronze is a lighter, warmer version of the classic tone, while Ash Gray brings a warm option to the typically cooler color. 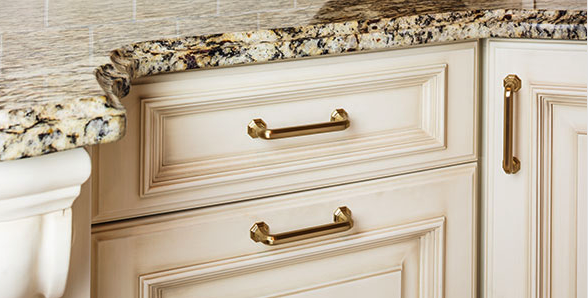 Honey Bronze “adds the perfect touch of old-world charm to kitchen and bath designs,” says Christine Zimmer, product manager for Top Knobs and Vesta Fine Hardware. 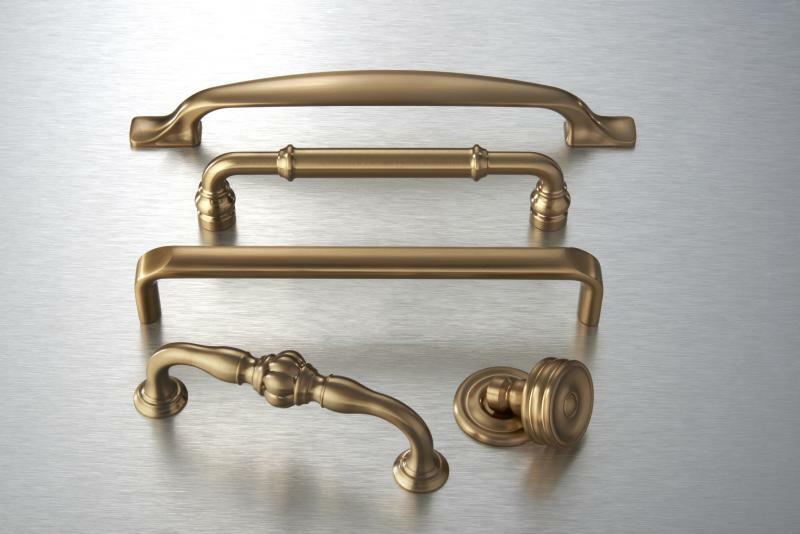 A number of the bathware manufacturer’s hardware options, including Iso, shown, are available in Brushed Gold, new for 2018. The new finish was created to meet industry demand for gold tones. To meet the demand for contemporary brass, Atlas Homewares has introduced a Warm Brass finish for 2018. It is available on a number of collections, including Elizabeth, shown here. As more and more homeowners are staying in their homes for longer, the need to renovate for aging in place is growing fast. Simple, easy-to-grasp bars and knobs can be helpful for anyone, but especially for those with limited mobility due to age or disability. Luckily, there are plenty of accessible hardware solutions that do not sacrifice style. Aiden is the manufacturer's latest addition to its Elements collection. It includes three sizes of high-arch pulls and T-shaped knobs for easy handling. The collection comes in four finishes, including Brushed Oil Rubbed Bronze, Brushed Pewter, Polished Chrome, and Satin Nickel. Contemporary design is becoming increasingly popular: A 2018 kitchen trend study from Houzz found it to be the second most popular style behind transitional. When it comes to hardware, think clean lines, minimal adornment, and stainless steel finishes to fit this trend. 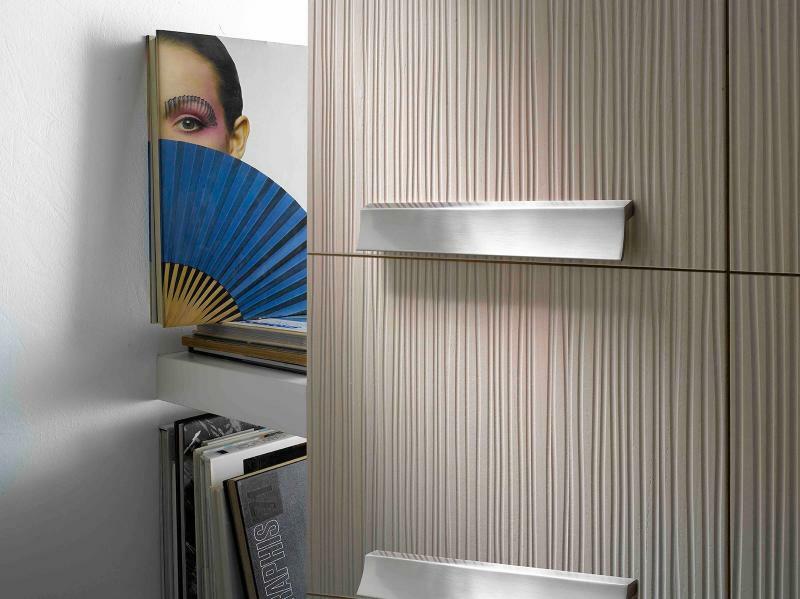 The minimal Emerge was designed to blend into the cabinetry, emerging from the surface with clean, sleek lines. 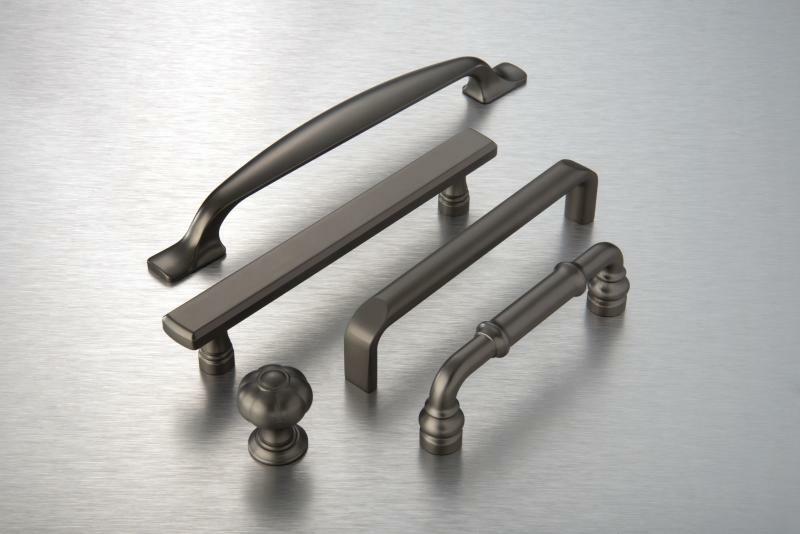 Two pull sizes and three knobs are available in chrome, polished nickel, satin nickel, and oil-rubbed bronze. 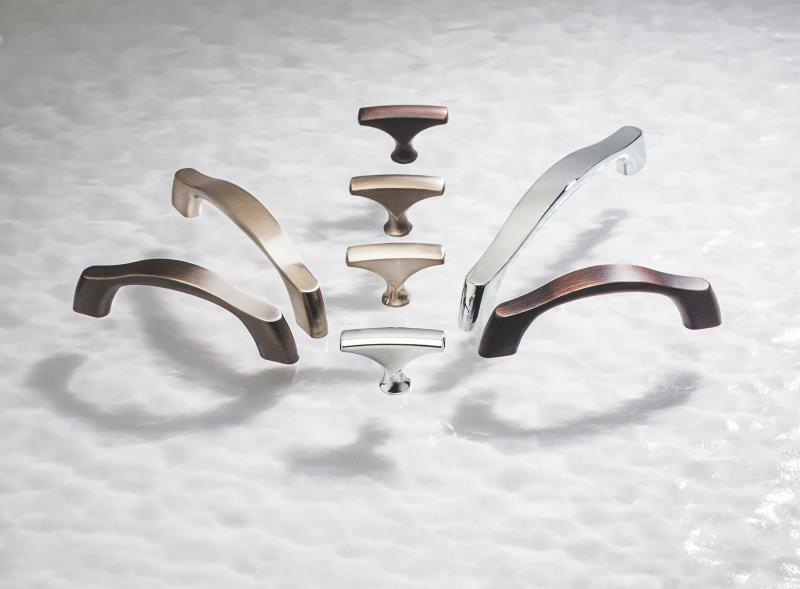 According to the manufacturer, the Sv collection features a “futuristic, streamlined design.” Two handle shapes are available in anodized, polished chrome, and coffee finishes. The ever-expanding variety of available finishes is giving designers and remodelers more liberty to mix and match. According to a blog on the Home Depot website, it’s best to mix finishes with similar color temperatures, such as “classic oil-rubbed bronze fixtures mixed with lighter, but similarly warm Champagne bronze and brass.” Some hardware pieces even mix several finishes or materials within one unit. The Firenze mixes a sleek metal base with Italian marble. 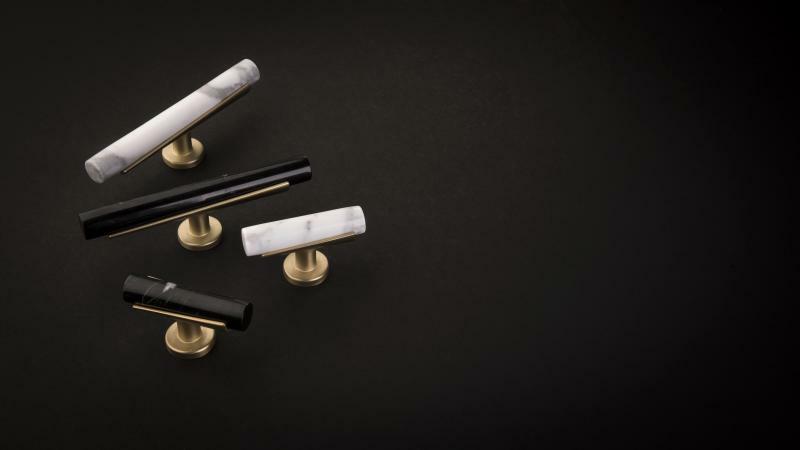 White marble can match with polished nickel, oil-rubbed bronze, or brushed golden brass bases, while the black marble comes with a brushed golden brass base. Matte black has become an especially popular alternative to silver-tone finishes in modern interiors. “There’s no denying that black fixtures have made a comeback as one of the hottest trends in kitchen and bathroom designs. Traditionally chosen for more modern spaces, the matte look and feel of a Flat Black finish adds a touch of drama and contrast to designs,” says Zimmer. 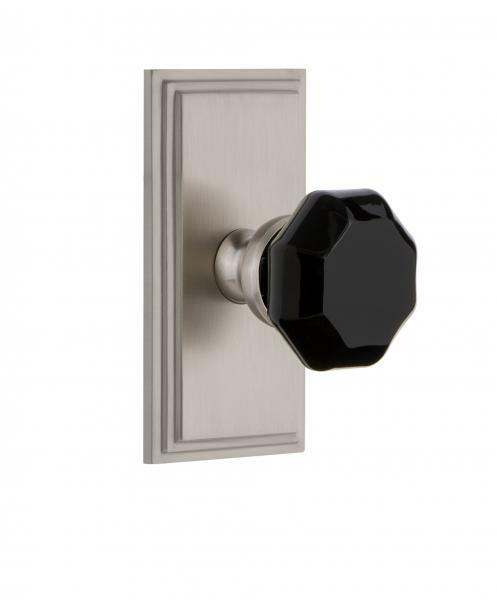 The door hardware manufacturer has introduced two knobs in new black materials, including the Lyon knob in black glass (shown) and the Coventry knob in black porcelain. 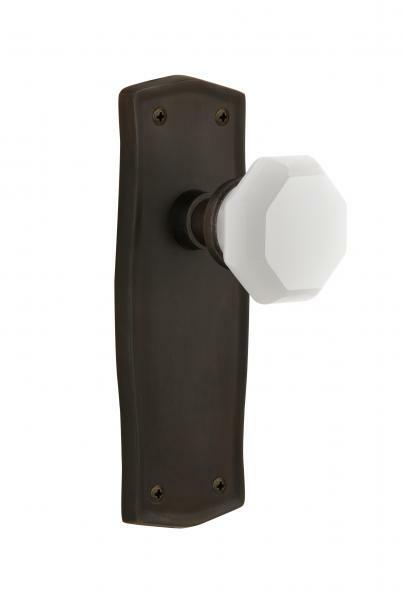 Especially popular in urban remodels, industrial-style hardware will fit right in to home interiors that include exposed brick, wooden beams, or concrete floors. Inspired by industrial design, the Ronan collection is handcrafted from solid brass. It is available in five finishes, including brushed satin nickel, polished brass, polished chrome, polished nickel, and unlacquered brass. A nod to the past can still be forward-looking. Sometimes adding vintage details to a modern home can hit the right transitional mark. These vintage-inspired looks can find a place in a traditional or modern home. 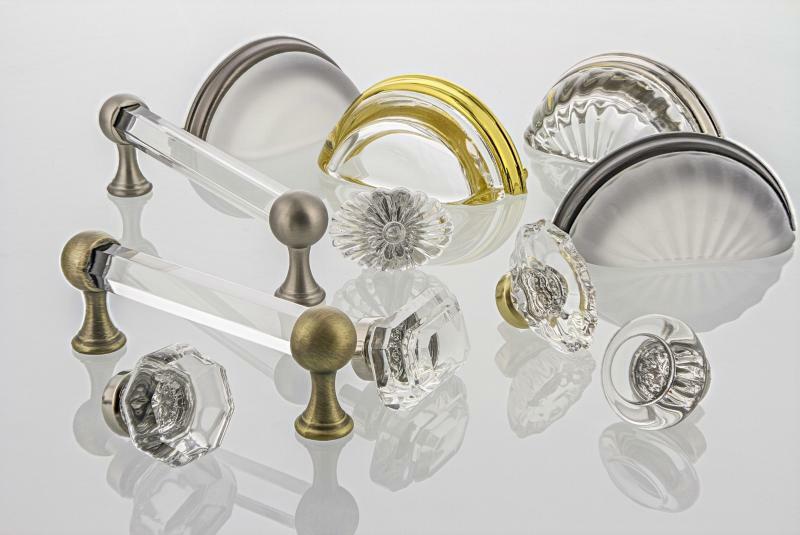 Made from lead-free crystal, the Vintage Crystal cabinet hardware pieces are paired with solid forged-brass ferrules in nine finishes, including Antique Brass, Antique Pewter, Bright Chrome, polished brass, satin nickel, Timeless Bronze, polished nickel, and unlacquered brass. Nostalgic Warehouse has also introduced a new take on white milk glass, which was popular in the U.S. in the early 1900s. The Waldorf knob can be mounted on a number of brass back plates, allowing it to range from traditional to contemporary. 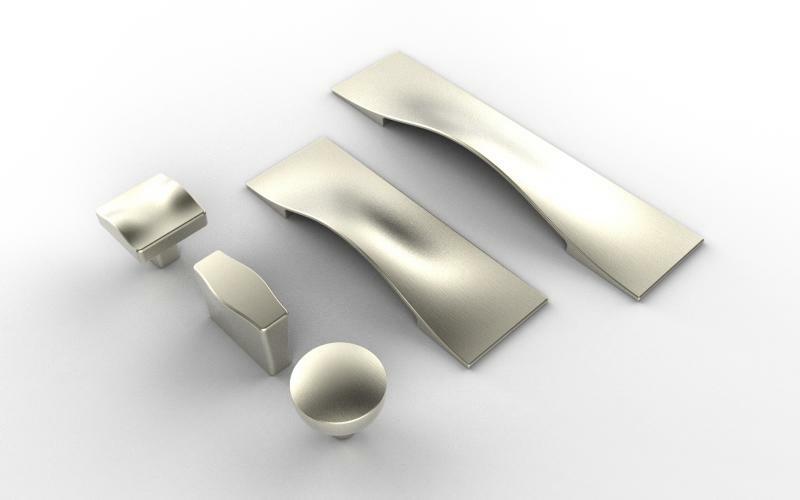 The brand’s Custom Door Hardware collection features combined interior locks that offer both bed/bath and hall/closet functionality in one. 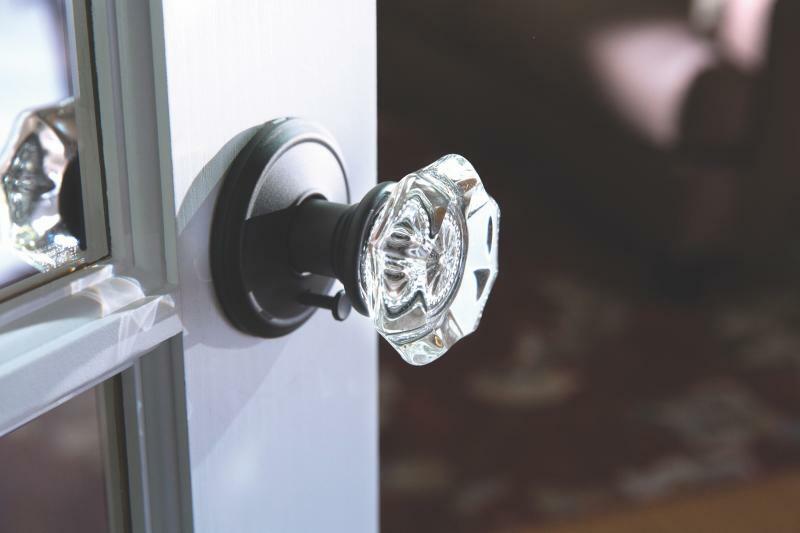 It allows homeowners to change from a doorknob to a lever, a traditional look to a modern look, and from a non-locking door to one that is lockable without having to remove the inner core of the lock.